Is there treasure hidden among the pyramids? 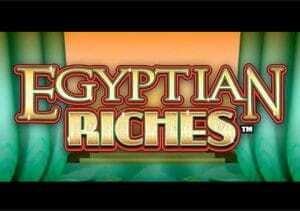 Go digging in the desert in Egyptian Riches, a 5 reel, 20 payline video slot from WMS. This low variance Arabian adventure may lack free spins but it does come with a pick me round that can deliver some decent amounts of coinage. Stakes range from between 20p and £100 per spin. The visuals are a little different to many (and there are many) Egyptian-themed slots – the setting is the interior of a pyramid. Symbols on show include ankh, cartouche, vase and scarab which are the lower payers. More lucrative are the cat, falcon, eye of Ra and the dog god Anubis – 5 of the latter pays 35 times your total stake. The top paying symbol is the Egyptian Riches logo which pays 0.5, 5, 50 or 250 times your total stake if you land 2, 3, 4 or 5 in concert. This symbol also acts as the wild, replacing all other symbols bar the bonus scatter. The Cleopatra style woman is the bonus – land 3, 4 or 5 of them anywhere on the reels and you’ll trigger the game’s only feature, the Egyptian Riches Bonus feature. Once triggered, you’ll be presented with a selection of 5 scarab beetles – pick to reveal a cash prize. You’ll then be taken to a second screen containing 25 treasure chests. Behind each chest you’ll find a cash prize, pick again or collect. You get to keep on picking until you land the collect. Multipliers can be applied to these payouts too, depending on how many bonus symbols triggered the round. Activate the feature with 4 bonus symbols and your feature wins are doubled. If you triggered with 5, those payouts are quadrupled. Visually, Egyptian Riches is rather nicely done – the cartoon style image are neat and crisp against the plain white reels with the action playing out to a catchy Arabian style soundtrack. If you’re expecting highly volatile treasure hunting, then Egyptian Riches a little disappointing. This is a fairly low variance affair making it a good place to start if your bankroll is a little stretched. The pick me round is solid enough but we’d have liked to have seen some free spins added to the mix. That said, if you fancy some simple, low variance spins then Egyptian Riches offers just that. I would rather play other similarly themed offerings like IGT’s Pharaoh’s Fortune.